It is recommended and in many cases compulsory, for all students participating in sport to wear a mouthguard. 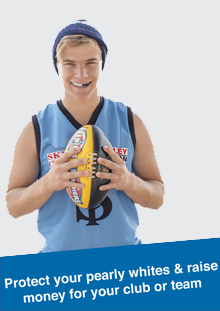 If your son or daughter is playing sport without a mouthguard they may be running the risk of serious dental injury. Even in non-contact sports, accidents can happen, but damage can be dramatically lessened by wearing a mouthguard. Off the shelf mouthguards can be poorly fitting and less comfortable to wear. Getting a mouthguard properly fitted for your child's mouth is the best way to protect their teeth. It can also reduce head injuries, such as head fractures or concussion. Designer mouthguards have a wide range of club and school team colours and are made by a qualified Dental Prosthetist using a very tough construction system giving extra protection and comfort. All mouthguards are made here in our clinic in South Australia using Australian products.